The Isle of Portland, four miles south of Weymouth, famous for its oolitic limestone called Portland Stone which is extensively quarried, is actually a peninsula connected with the mainland by a long narrow ridge of shingle called Chesil Bank. The site was formerly part of a Naval base. 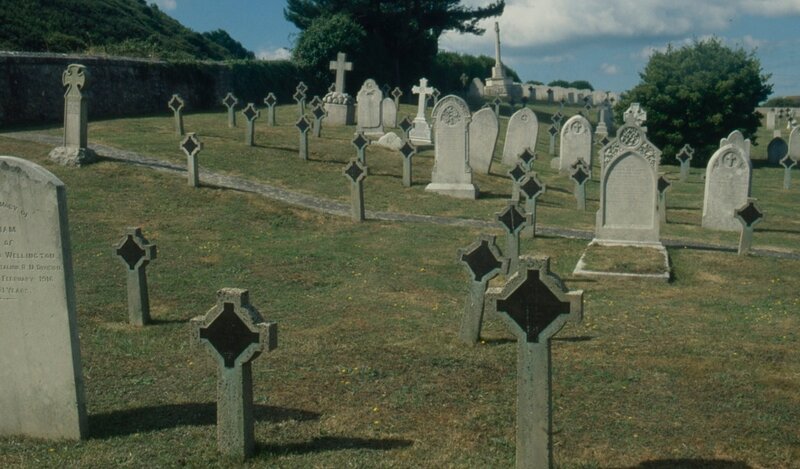 The burial ground lies on the northern slope of Portland Bill, three-quarters of a mile due east of Portland railway station. To reach it follow the main road from Victoria Square (the bus terminal at the end of the causeway connecting Portland to the mainland) uphill past the first right-hand hairpin bend and the police station, which is beyond this bend on the left; then take the first turning on the left (Verne Common Road) through and just past the council estate to a track running left downhill. From this point the cemetery can be clearly seen. 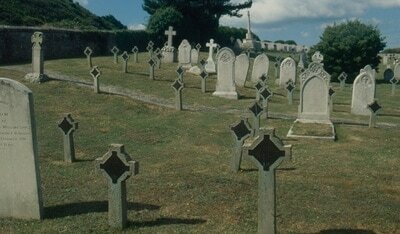 It is divided into three parts, Church of England, Roman Catholic and Non-Conformist, and contains war graves of both World Wars. 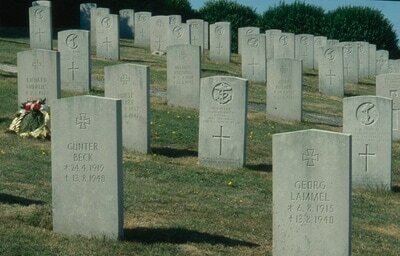 Sept 2013 - Portland Royal Naval Cemetery is owned by the Ministry of Defence. On some occasions the top gate is locked to vehicles but access on foot is still possible. If the gate is locked and you need to enter the Cemetery by car, a key is held at the Control Gate at the Port. 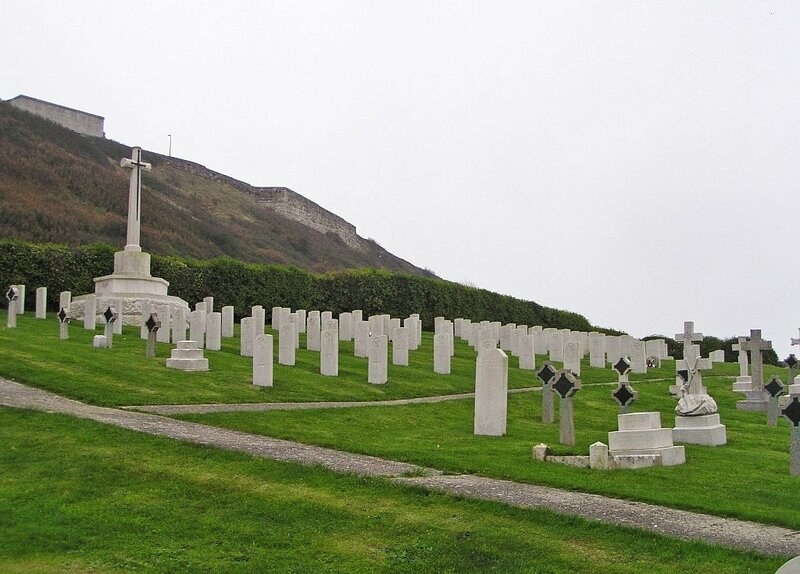 The 1914-1918 burials number 65, of which 5 are unidentified, and after the war a Cross of Sacrifice was erected to commemorate these men near the southern wall of the western part overlooking the harbour. 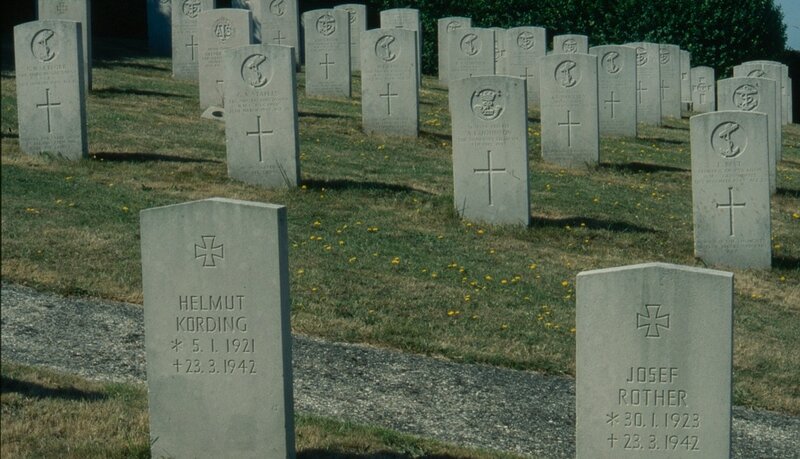 Most of the 1939-1945 War graves are together in the Church of England section, near the Cross of Sacrifice. There are in all 103 burials, of which 10 are unidentified, 1 is a Norwegian Merchant Navy seaman and 12 are German airmen. 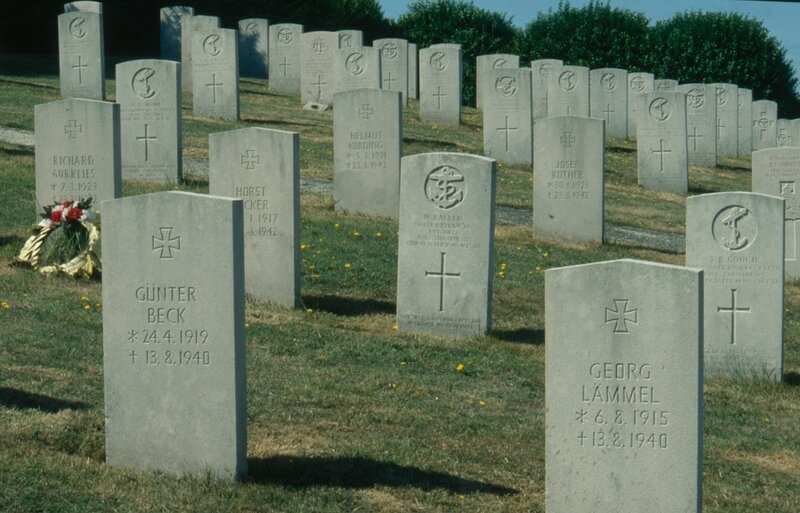 In addition, there is a 1914-18 war Special Memorial to a casualty buried in Portland (St. George) Churchyard. 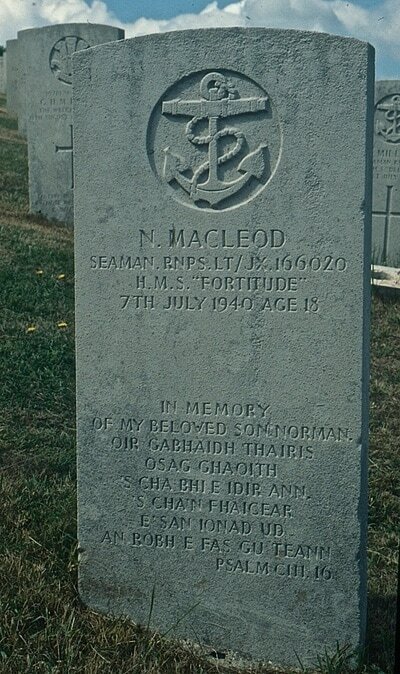 P/JX 139070 Leading Seaman Jack Foreman Mantle, V. C.
H. M. S. Foylebank, Royal Navy, died 4th July 1940, aged 23. C of E. Portion. Grave 672. Son of Lisle John Foreman Mantle and Jeannie May Mantle, of Southampton. 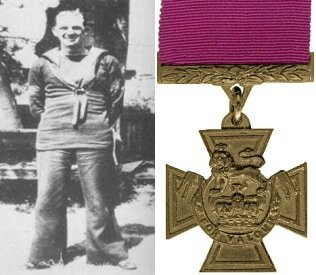 Citation: The following details are given in the London Gazette of 4th September, 1940: Leading Seaman Jack Foreman Mantle was in charge of the starboard pom-pom when H.M.S. Foylebank was attacked by enemy aircraft on 4th July, 1940. 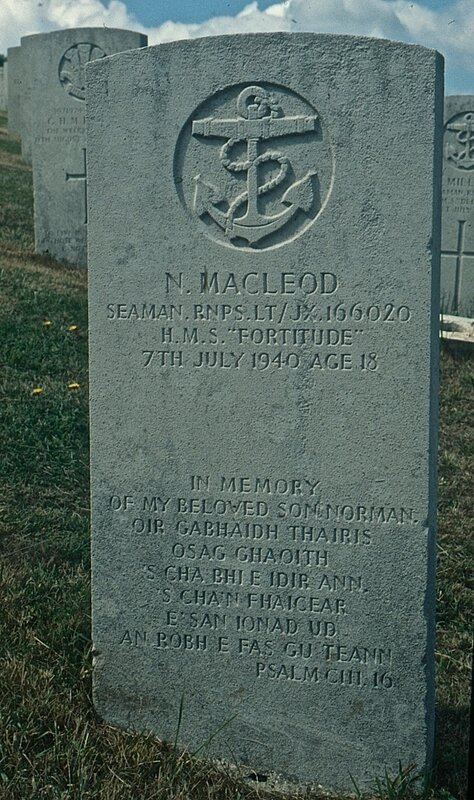 Early in the action his left leg was shattered by a bomb, but he went on firing his gun, with hand gear only, for the ship's electric power had failed. 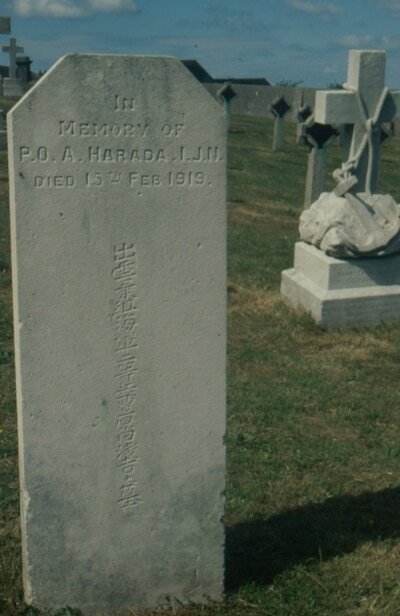 He suffered several further wounds but his great courage bore him up until the end of the fight, when he fell by the gun he had so valiantly served.